I love a good upcycling project, but I really don’t do them as much as I’d like to. Well, you know, I’m always up for a little challenge to get my creative juices flowing, right? The highlight for me is that this is the first time actually creating something cool with a microwave tray and soup cans that would have otherwise been tossed in my recycle bin. 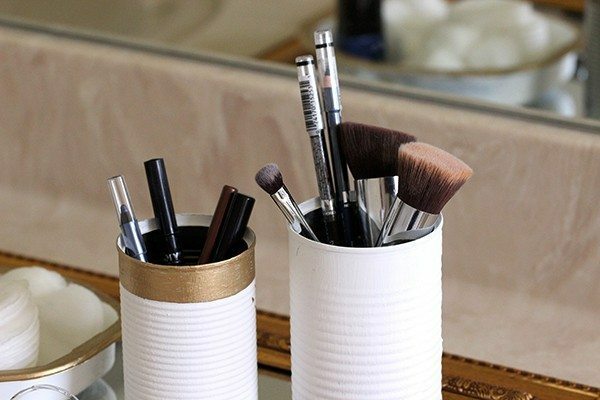 A DIY Makeup Organizer made from trash? 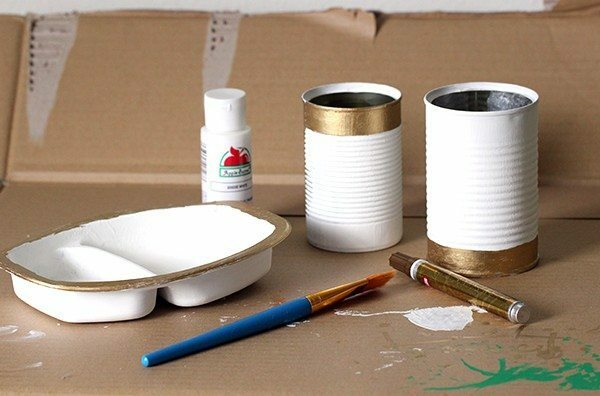 With Earth Day this week, I thought it was perfect timing to share a unique idea for upcycling! This is a sponsored post brought to you by Green Works®, all opinions expressed are my own. My hubby is the one to thank for most of this project simply because he was up really late one night and got hungry. Enter the rogue microwave tray. While I was brainstorming, I saw it sitting next to the sink awaiting a good rinsing and one-way trip to the recycle bin. It’s pretty amazing what you can come up with when you get some inspiration (random or not) and let me tell you, it feels really good too! Like most people, spring cleaning is on my mind right now. With cleaning comes the nagging urge to get organized too. I mean, how can you clean with all that clutter? Getting cleaned up in a green way can be surprisingly effective. Have you tried Green Works yet? They have a whole line of cleaning products and even laundry detergent. They’re naturally-derived and affordable too. I’m guilty of being a cleaning wipes user, they ARE in fact, my favorite “get clean quick” plan for all areas of my home. I really like that the Green Works brand are actually compostable!? Makes them a really great choice for keeping a green home. The best part? They are perfect for getting your space ready to showcase your own awesome DIY projects this spring. Want to know how I made mine? Squeee! I am really excited about this! Can you even believe that? I get goosebumps watching it! My takeaway? You don’t have to compromise on clean to be green AND with a little inspiration and creativity we can really unlock true treasures in the world around us. 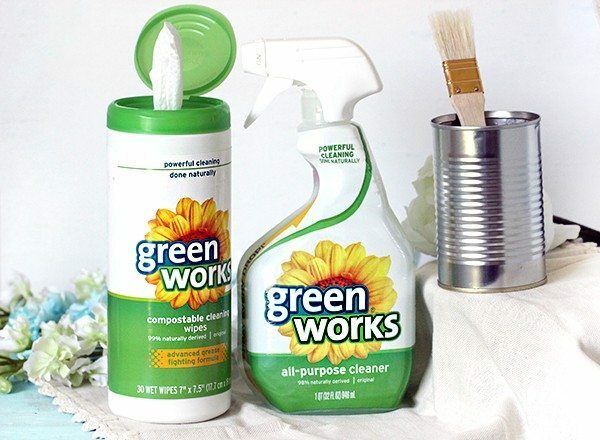 Check out the largest selection of Green Works in the natural cleaning aisle the next time your shopping at Target! Stay in the loop & connect with Green Works on Twitter and Facebook for updates! Have you been on a mission to clean & get organized this spring? What are some other upcycling projects you have come up with or would like to try out? Share! 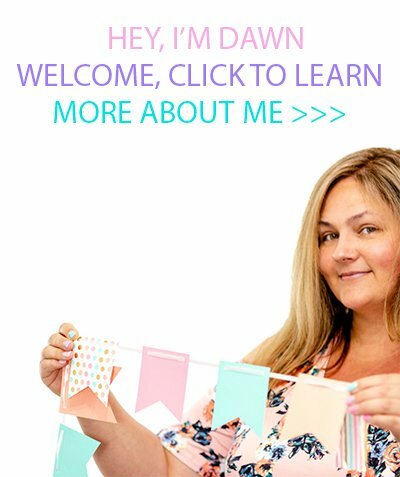 What a creative and clever idea, Dawn! I need to do more upcycling! How awesome is that to take something that was going to be stuck doing nothing,, in the trash to turn it into a beautiful piece or art.. nice! That is such a cute idea! I'm always looking for new and creative ways to store my makeup. Super cute. I am partial to re-using glass jars, myself, but your little touch of gold on the cans looks nice. That is an awesome upcycle! You did such a great job. I am normally not a huge fan of gold but I have to say these are really cute and a great idea! I love upcycled projects. Thanks for sharing! 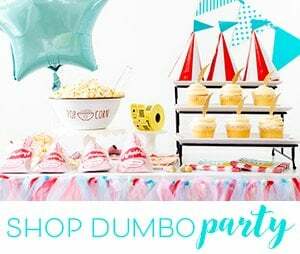 Visiting from the Sunday Showcase linky party. awesome ideas!! i would never have thought of those myself!! very cool. I love Green Works cleaning products. But I don't upcycle. I don't have enough room to keep all of the stuff. I just recycle everything I can. What a great idea to upcycle. 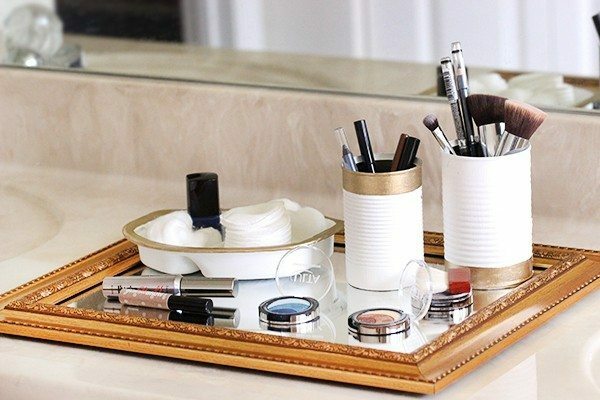 I am sure I wouldn't have thought about making a DIY makeup organizer. This looks great! I love the idea of putting them all on a mirror, that is very creative. I love upcycling. If I can repurpose/reuse something I already have instead of throwing it away to fill up the landfills, that's a good thing! I love this idea.... it turned out so pretty! Those turned out really nice. You did great. That microwaveable tray is genius! I have never seen one reused, but I always have them in our recycling bin. I'm inspired to see what else I could use them for. I often see a lot of upcycle projects where people just make stuff. I can't do stuff. It just clutters my house. But I love everything about this. 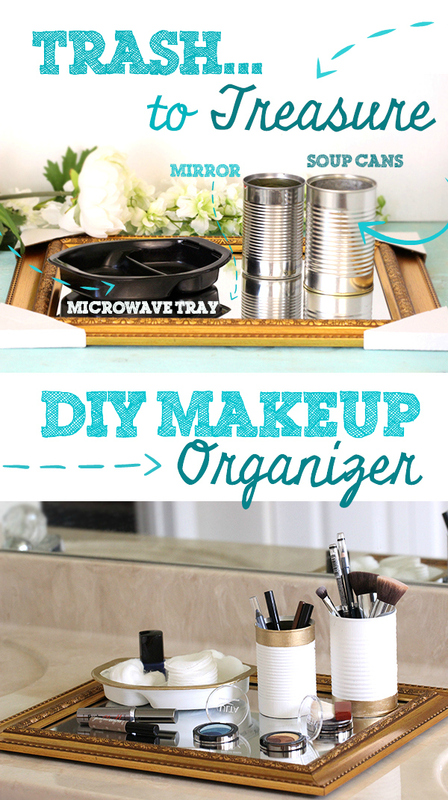 I don't really need a makeup organizer, but this just gave me some awesome ideas on how to use a trash to treasure diy to create some organization in my office and on my desk. OH so cute! 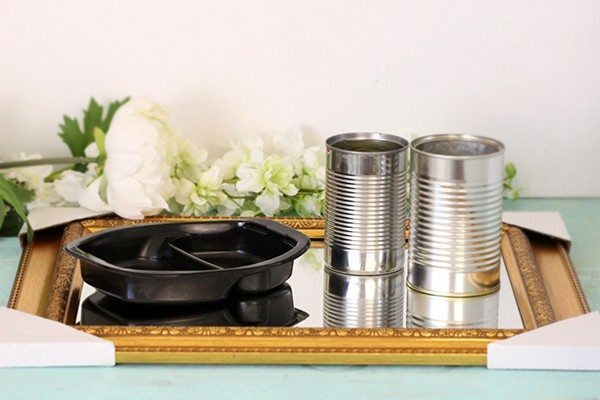 I love how you upcycled trash into something that is more than just pretty but also useful! Great job! I'll be watching for Green Works. 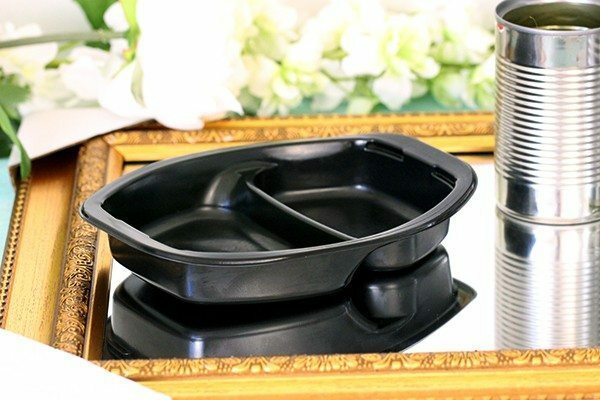 I like how you converted the rogue microwave tray to a holder for jewelry and such. I am going to convert the next ones I use into trays for craft projects. They look so cool! Smart thinking for an upcycle. I like the white can with the gold rim too. Simple and pretty, not to mention useful! 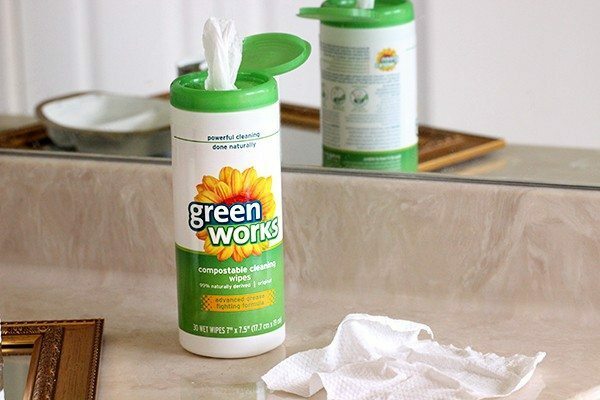 I love the Green Works wipes. We have used them often. And my favorite part is they're compostable. I love DIY and Upcycle projects! I never thought to use a take out try and spray paint it...that is innovative! This is such a great idea. I love how simple it is to make. It looks great. The most cherished material possession I own is a mirrored perfume tray that my grandmother used. I love this DIY because now I can make my daughters something very similar to an item that is so special to me! You did an awesome job. We just used some recycled 2 liter bottles for floats on a sifter we made. We are doing a fossil dig in the Peace River on Saturday. Thanks! Oh wow Catherine, that is SUCH a wonderful idea, how clever! A fossil dig sounds like so much fun! Sounds like the best weekend ahead! You did a great job making these things look pretty! Gold and white colors were great choices! This is THE definition of a good DIY project. I love how you took items that are so mundane and turned them into something sassy. It's great! This is the kind of DIY project I love. The colors are really nice, and it's super easy to make. Thanks a lot! Wow! What a great idea! I love this and could for sure do something like this! Not only for my make up stuff but my girls play make up too! Thanks so much Jeanine! What a great idea, I bet kiddos would love something like this too! You really did make treasure out of trash! I love the upcycled cans and microwave carton. They turned out great! Thanks so much Theresa ;) I really appreciate that!